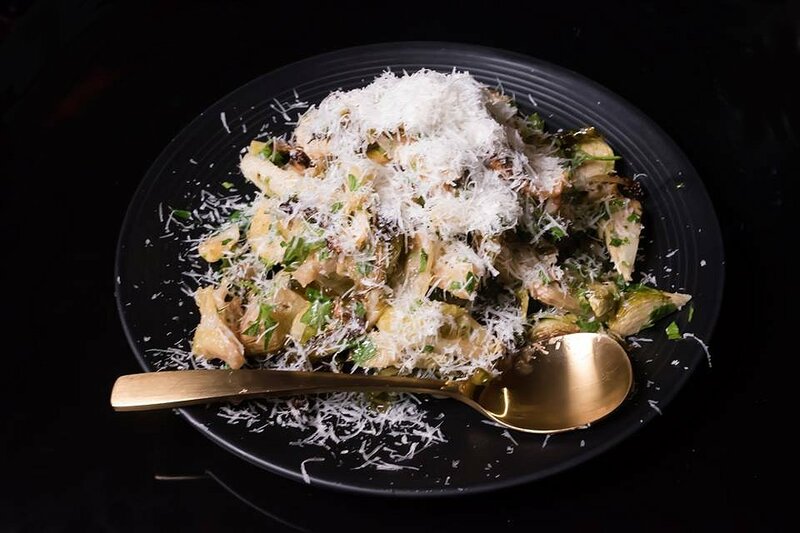 For those that aren’t familiar with the Melbourne food scene, Adam D’Sylva is one of the best and innovative chefs in their state, as well as co-owner and executive chef of Melbourne restaurants Tonka and Coda. Adam has teamed up with Luv-a-Duck to host a one night only pop-up restaurant at Rokeby Studios in Collingwood. Distinguished guests and influencers went on a culinary adventure as we were treated to eight exquisite dishes, all showcasing duck. First up was the Tea-smoked Duck Breast Rice Paper Rolls. I’ve had a variation of this using Vietnamese pork meatballs, but this was equally as good. 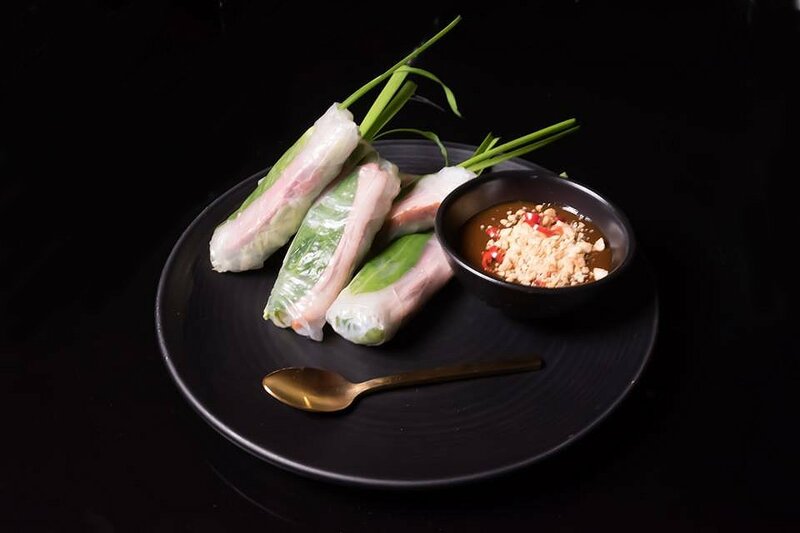 Thin slices of tender smoked duck breast were combined with vermicelli noodles and a basil leaf, and wrapped in a chewy rice paper. What actually makes the dish is the dipping sauce; hoisin sauce with crushed peanuts and fresh chilli. The duck meat and the dipping sauce go hand in hand. The Hoisin Mayo Duck Baos were also a favourite. This dish was an interpretation of the classic Peking Duck Pancakes. 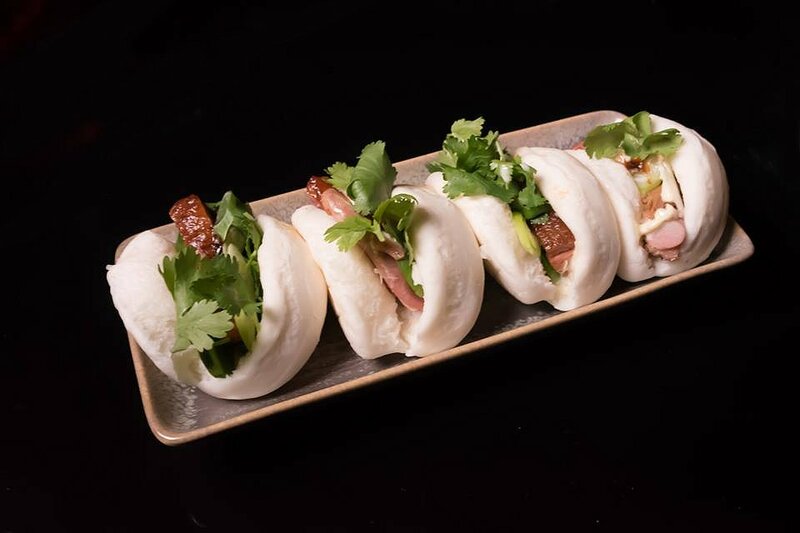 The crispy morsels of duck were combined with coriander and onion, and wedged in a soft and fluffy bao. Hoisin sauce can be rather sweet but this was toned down with the inclusion of mayo. 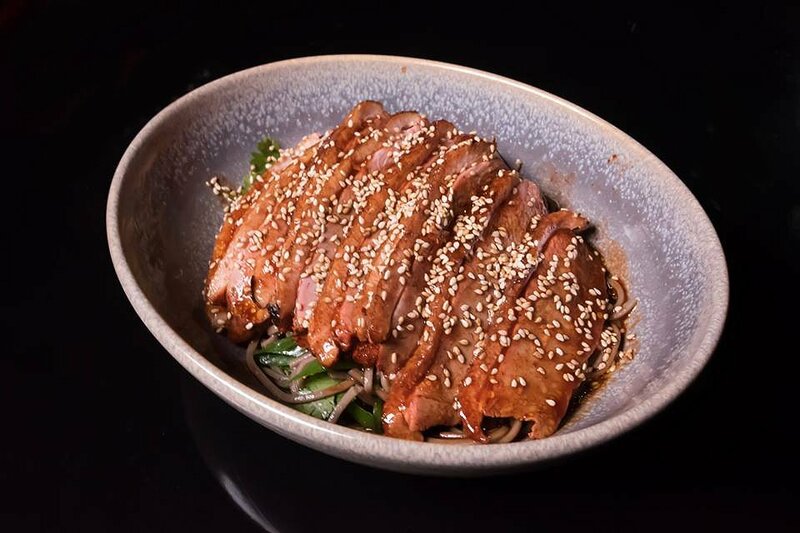 The Peking Duck Soba Noodles is a perfect summer dish. The marinate on the duck slices was similar to what you’d find on Chinese BBQ Pork. The soba noodles were light and refreshing, with a hint of zest. This was a good balance to the subtle sweetness of the duck. Adam’s part Italian heritage comes to the fore with the next dish. 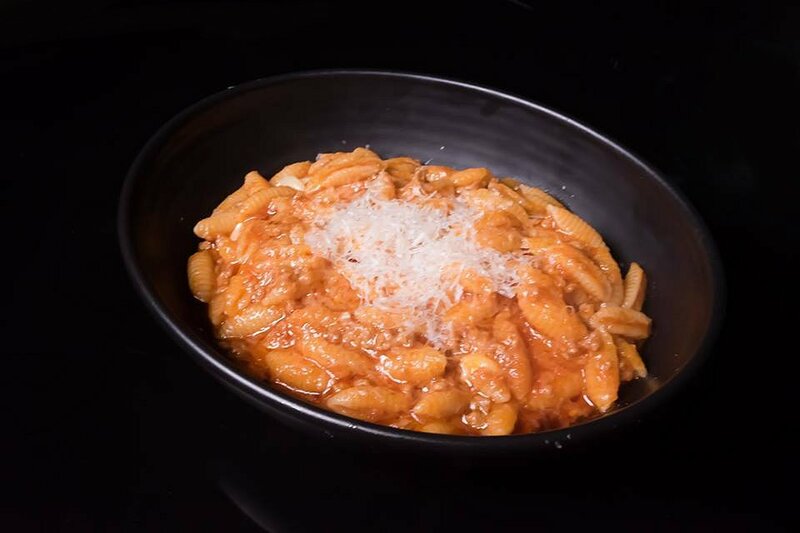 The Duck Bolognese with Gnocchetti Sardi was a very generous serving and could have easily fed three. The dish was very similar to the Spaghetti Bolognese we get at Fasta Pasta in South Australia. A very rustic dish with lots of gooey cheese. A perfect winter warmer. Continuing the Asian theme, the next dish was the Crispy Skin Duck Breast with Ponzu Dressing. The skin was crispy while the pink centre of the meat indicated it was perfectly cooked. Swimming in a shallow pool of ponzu dressing, there was some zest, but not very much. The accompaniment to the previous dish was the Duck Fat Roasted Brussels Sprouts. It’s a personal preference as to how you like your Brussels sprouts cooked. I like the bitterness removed, however, other people don’t mind it. The Brussels sprouts themselves retained a good level of firmness, and there was a good balance of bitterness and zest. Not bad when combined with the crispy skin duck breast. 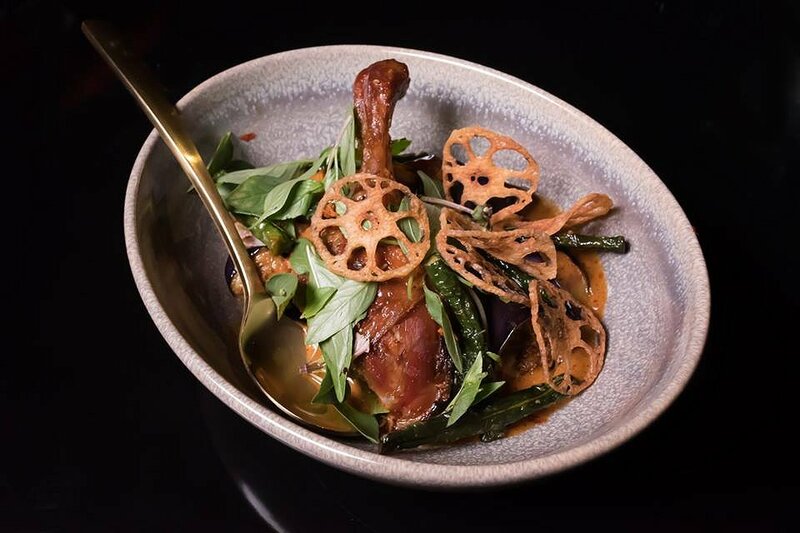 One of my favourite Thai dishes is a red curry and I was pleased to see the Red Duck Curry on the menu. The skin of the duck was deliciously crispy, and the meat simply fell off the bone. The taro chips added a nice crunchy component, while the spicy curry sauce went perfectly well with the duck. I’m used to Thai red curries with a generous amount of sauce, so I felt there could have been a bit more. Delicious nonetheless. As we always say, there’s always room for dessert. But how do they incorporate duck into a dessert? The answer is the Chocolate Pot with Coconut and Duck Foam. Tasting the foam by itself, there was a touch of saltiness to it. 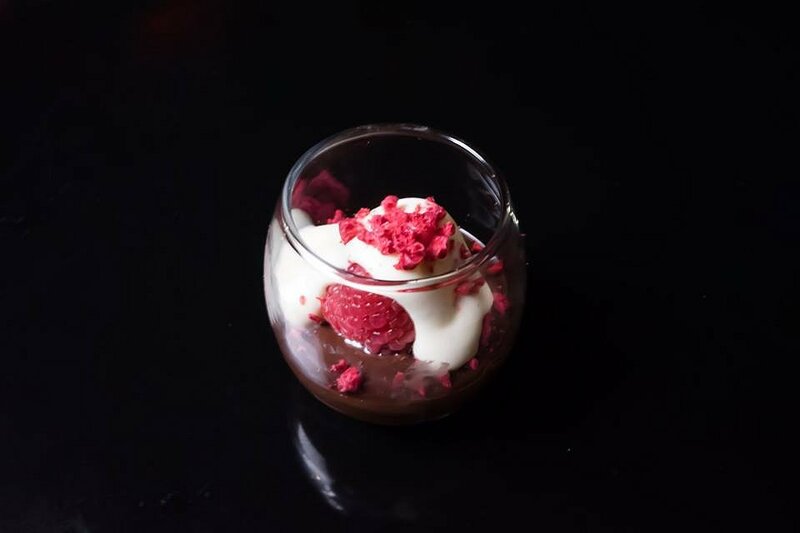 The dessert itself was rich and decadent with good use of raspberries to complement the sweetness. I guess you don’t want to put too much duck into a dessert! At the end of the evening, Adam surprised us by revealing that he did not cook the dishes but only designed them! All the amazing dishes on the night were prepared by amateurs with very little cooking experience. 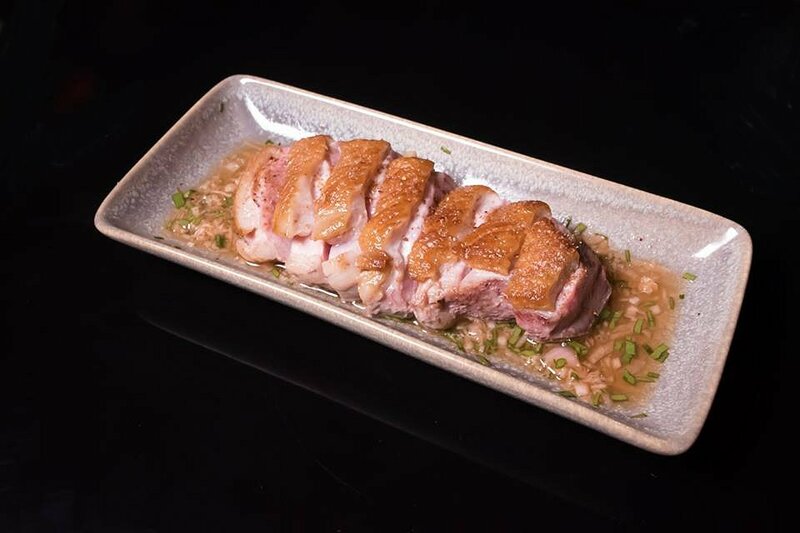 It showed the versatility and ease in which you can create tasty duck dishes at home. Adelaide Food Central would like to thank Adam D’Sylva, the amateur cooks, and all the staff for all the delicious food and providing a fun-filled evening. We’d also like to thank Progressive PR hosting and taking care of us while in Melbourne. Guess it’s time to get cooking with Luv-a-Duck duck!